Kevin and his son, Jeffery are from St. Louis, Missouri, and joined us on Monday for their first ever fly fishing adventure. There really are no more fun trips than these father and son trips and having the opportunity to watch these family relationships. 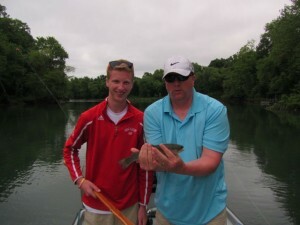 We worked on a little casting and before long both father and son had their first trout on a fly. As always those fly were cut off the line and given to the angler as a remembrance of their first catch. In Jeffery’s case it was a #14 RG/PT Cruiser and for Dad it was #1$ Born’s Hairy Legged Sowbug. 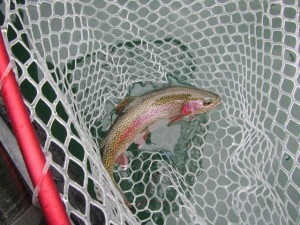 It was a really enjoyable day with nice weather and good water conditions. I bet both will be back to see us soon!